Porlex Mini coffee grinder (hand) with ceramic burrs. 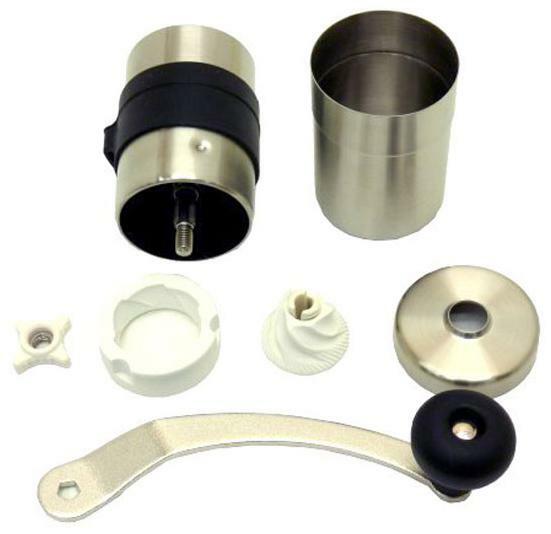 The Porlex Mini coffee grinder is probably the most transportable quality burr grinder we recommend. In fact that is primarily what we use it for. This manual grinder uses a porcelain conical burrs, has many grind settings and is stainless steel. 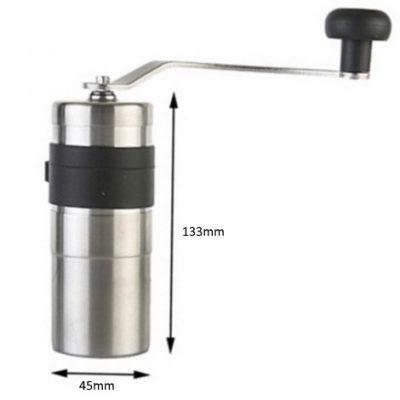 It has an easy to use grinds container which can be used to measure the beans before grinding. With extra fine to course grind settings, you can use it with any brew you love. It is very small, fits in to the top of an AeroPress. The grind is of a high quality, can even do espresso grind. You can hold it in own hand and turn it with another, so grinding is easy. Rubber holder for handle, for storage. Small base means it fits any scale. Burrs easy to remove and clean. Since it is stainless steel, easy to clean and is long lasting. Old model the handle slipped of the top easily, much better now. Relatively high price point. 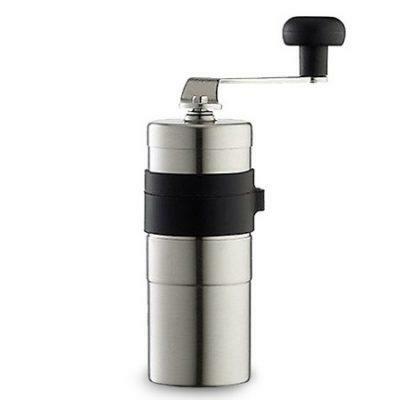 It grinds roughly the same amount of coffee as the Hario mini, but costs more than twice the price. Although grind consistency is better. The grind adjustment is hard to calibrate, you have to count clicks left and right. Body made of static-free stainless steel. Weight of less than 250g. Body measures 4.5cm (radius) x 13.3cm (height). Grinds up to 25g of coffee at once. Worth noting is that there are a number of copies on the market, including the Rhino. These copies cut corners with the handle and the burr quality. Currently we had stayed away from offering these.